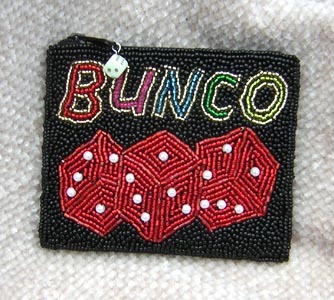 Bunco bag beaded and beautiful with the look of glitz and pearls. These bags were made just for the Bunco enthusiasts. This Bunco beaded bag is perfect to place your jewelry in when traveling … or to hold your lipstick and beauty items. The Bunco enthusiasts will truly cherish this conversation bag and enjoy taking it everywhere she goes. Be the first to purchase this for you …or for a Bunco friend. The Bunco enthusiasts are sure to love this beaded embellished party bag with the dice for the zipper pull. A look of an heirloom and comes in three styles.